We know that social media marketing is vast and multiple templates are required when a campaign is launched. But, the template that sets direction is the planning template. Let’s consider this example. The business owner/manager requires more online leads. The digital marketing manager steps in and says, we can run a lead generation campaign on Facebook. They send their requirements to the content team, while they discuss publication timeline, promotion ideas and the budget required. The manager approves, the rollout begins. 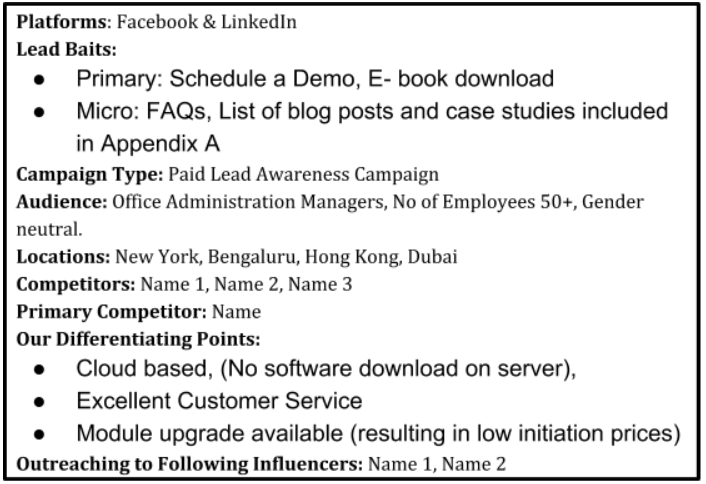 It seems like a solid plan and most social media planning templates online cater to the steps below. When creating a social media marketing plan, this is the norm that we generally follow. Though the work is compartmentalized, the silos structure works pretty well. In this scenario, the entire team above sits together, and the manager says we are low on revenue and need to bump up leads, let’s build a campaign to increase lead inflow. Now the Analysis team, Manager and Digital Marketing Head analyze the current status and the competitor status. 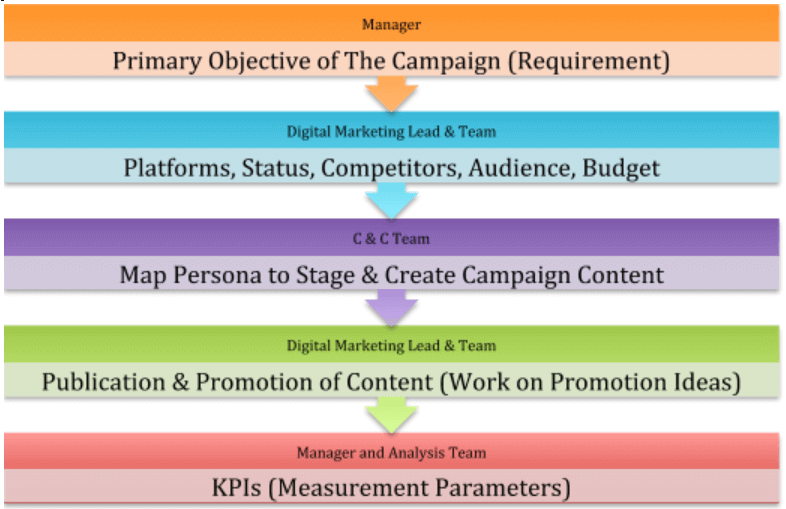 They identify the KPIs of a successful campaign, the probable budget, what has worked earlier and other factors. An extra 1-2 hours at the planning level and 4-5 extra hours at the implementation level will bump up your ROI by at least 43%. Yes, it’s possible, and we have done it, and that is why we are mentioning the figures. Details are in the figure below. Tweak: Apart from macro objectives, elaborate micro objectives too and add actions to take on them. Social media works differently from other channels. People and prospects are here to socialize, see what others do, discuss their pain points and ask for advice. It’s difficult to neatly categorize prospects into stages. For instance, the macro objective might be lead generation, and the lead bait might be a free e-book or demo. In most of the campaigns that we run, we find there are a lot of questions asked before prospects take up the bait. This is because of the channel. In paid and organic search, the intent is established. Social media works differently. Engagement on social media is easy for the prospect, and they assess you through your response. On social media, prospects are not exactly looking to be pitched to, therefore if they converse or engage, appreciate it. It indicates that the prospect is in the awareness/consideration stage. A lead generation campaign is targeted toward the decision-making stage. In such a case, the prospect was attracted by your lead generation campaign but has not converted, what should you do? Ignore him? Give them a statutory response? In a campaign run by a SaaS company recently, a lead generation campaign had a free trial as a lead bait. Instead of signing up for a free trial, there were a lot of questions about the software. This business had a blog post for each question, some of which contained downloadable case studies. While the first 15 days of the campaign had 10% ROI on campaign cost, once they started referring those engaging on social media to the relevant posts, the ROI steeped to 82%. Lesson learned: While prospects may be attracted by your campaign, they may not be ready to make a decision. Take care of those micro-steps. Include a section on micro objectives and lead baits or appropriate response for each in the planning section. 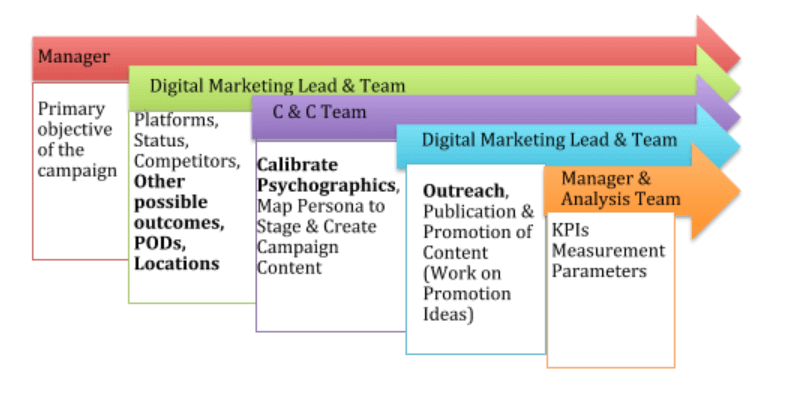 Normal: Take out the previously created buyer persona and plan campaign content based on it. Tweak: The primary objective and the psychographics behind the action required should be taken into consideration along with the buyer persona. Consider this. You are running a campaign to increase your reach or brand awareness. Sometimes, as a lead bait, we make a discount offer. Once you make a discount offer or a partial product offer, you attract more people of an extended persona who could be your future clients. Your campaign content should identify the psychographics of this extended persona and run special campaigns for them. Take this example. Your persona says ‘probable buyer- entrepreneur with cash to spare who values his time.’ So, when you offer a discount on your product, those prospects who think that they have no cash to spare will also turn up for a free trial. If they find value in your product, they may decide to stay with you despite the fact they may be squeezing payment. If this is your objective, your campaign should address their concerns. When launched a workshop on digital marketing, they had just one objective – low cost digital marketing knowledge for those who could not afford the full course. It was an extended persona of ‘those who want to make digital marketing their career’. They delved into the psychographics and launched ads for each possible segment. This increased their reach and conversions considerably because of the messaging connected. Lesson Learned: Once you calibrate the psychographics, the campaign content road is clear and you can build micro-targeted content. Your campaign content caters to the emotional connect between psychographics ad location. Suddenly the campaign becomes more relevant to the prospect and conversions happen. Tweak: Find major concentrations, and if possible, run location specific content in ads. We tested a video campaign on Facebook for a client in the B2C segment. In campaign A, we ran the same content all over the country. In campaign B, the content was same, and the background referenced a local location and where the actual location was not possible, just a popular painting/graffiti (of the location) was displayed in the background. The engagement on campaign B (with local references) was up by 18%. In another campaign, DMIOA ran specific location targeted ads that had local terms mixed into ad content. It was their lowest cost per lead campaign ever at 0.08 cents per lead. An extreme example would be Nike’s support of Colin Kaepernick, former National Football League quarterback, who 2 years ago started kneeling in protest during the national anthem before each NFL game against police brutality and racial injustice. While Nike’s risk threshold is extremely high, the people who are against Nike are not its target audience. And there’s nothing that galvanizes an audience faster than an attack by its enemies. Talking unapologetically to a SPECIFIC NICHE and NOT trying to be appealing to anyone else is the key to creating raving fans for your business. If you go into any platform with that attitude, you are assured of success. Lesson Learned: Local references in content or visuals is just an extension of psychographics. Social media is about the ability to build conversations and sustain interest. A local element can exactly do that. Adding local references where possible is a good way to build instant connectivity and awareness. By local, I am referring to a location within your country. The culture of New York is different from Los Angeles, the Scottish respond to Scotlanders and Londoners relate to different things, India has several different languages. What happens when a local influencer endorses you in a campaign. There are plenty of examples of roping in local influencers. This works extremely well in the F&B segment. D J Khaled is said to be one of the biggest influencers on Snapchat. Even brands like Adidas are connecting locally. The above picture is from a campaign run by Adidas who hired Brooklyn based artists to create murals for their New York campaign. 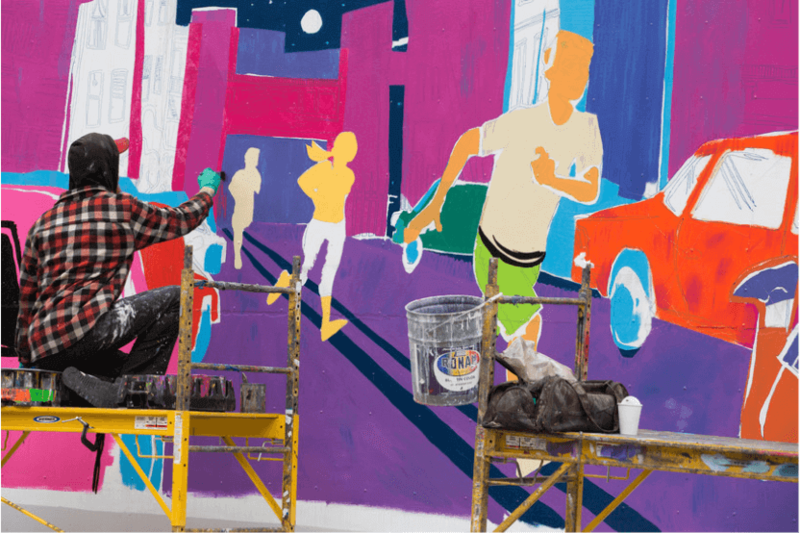 Adidas hired local mural artists all over the US. Consider the Adidas campaign of above. Each artist or agency roped in as a partner is a possible influencer, and each will reach out to their group of people. Adidas is a global brand, but it still understands the power of local. When local people get involved, it serves as a brand endorsement and validation. Normal: Run status and competitor analysis. Tweak: Discard one-upmanship strategy. Instead, focus on creating user value that builds a sense of belonging. Example – the ALS Ice bucket challenge that differentiated itself from thousands of charities. To come up with such strategies, you need to differentiate yourself from your competitors. In their book Blue Ocean Shift, Beyond Competing, the authors W. Chan Kim and Renee Mauborgne say that we have to begin by identifying the key factors the industry compete on. “Identify no fewer than 5 and no more than 12 key competing factors on the as-is strategy canvas.” Price is, therefore, one of the factors. GMR Transcription, a million dollar small business company, runs scholarship campaigns twice a year. The reason behind this campaign? Most of their clientele are professors and academicians. Unlike their competitors who invest heavily in paid search, they ask these professors to inform students about the scholarship program, and the social deed earns them good results with steady business. Additionally, it’s a good idea to identify one competitor and focus on getting better each time. Time again, whenever we are planning a social media campaign, I find myself returning to Robert Cialdini’s book Influence: Weapons of Persuasion, written way back in 1984, but totally relevant today. The steps that are added to the template have been inspired from his book and when implemented well have resulted in an increase in 112% ROI. We all know that social media mantra, LinkedIn, Fb B2B and Twitter, Instagram B2C. Let’s go a step beyond and think what we want from the campaign. Instead of the activity, focus on customer perception of your campaign; you will definitely benefit. DigiNekt is a digital marketing job portal that brings together job seekers and employers on a common platform. Our objective is to help digital marketing professionals get their dream job and digital marketing agencies to hire the best people for their team.